8 years ago, Fox/Walden’s The Chronicles of Narnia: The Voyage of the Dawn Treader opened to mixed reviews and disappointing box office. A recent poll indicates that the majority of our listeners have an unfavorable opinion of the movie. At that time, two NarniaWeb podcasters walked out of the theater with completely opposite reactions. Has time changed opinions at all? Listen to the discussion (or read a partial transcript) and post a comment! 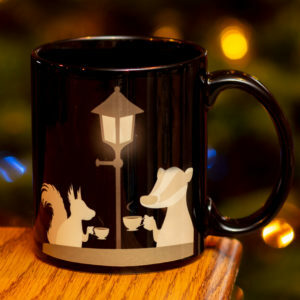 Talking Beasts mugs are now available! Order before Dec. 31 to get free shipping to the United States. Proceeds will help us keep this podcast going. Dawn Treader is an AMAZING movie! It’s brilliant and the more I watch it, the more I love it! I love everything about it! Seriously, the amount of hatred that coninues for this film is the reason we have not had anymore Narnia. Totally agree! Also, it’s not like it made no money, since it was the twelfth highest-grossing film of the year, and it would have made more if Fox had marketed better. Honestly, the reaction I get most often is "there’s a third one?" It came and went without much fanfare. For the first two movies, many writers released analytical books on those books, but most didn’t for VDT. Thanks for the comments! Hoping more people that enjoyed the movie will post to balance things out. Greetings Hoffman & Just Queen! Sorry to be a party pooper, but the film adaptation of “The Voyage of the Dawn Treader” stunk. Not horrible. Not even a travesty. Just stunk. There, I told myself I would not say that again. Disney was never intending to make all 7 Narnia books into movies, like Harry Potter. It was just cashing in on the success of The Lord of the Rings film trilogy. So when it left the series after the 2nd Narnia film, Walden Media didn’t know what to do with “The Horse and His Boy” and The Last Battle” (both controversial hits) without Disney’s security blanket. Then Walden Media chose Fox, and Fox killed audience interest in more Narnia movies in series because of way the 3rd film turned out. But I did like some things in that movie – I liked Will Poulter as EUSTACE! I don’t think it’s amazing movie or even an amazing adaptation, BUT I do not hate it as vehemently as my Star Wars friend hates the Last Jedi. I have a more polite indifference, if that makes sense. Like I thought that although the dialogue was pretty bad (show don’t tell! ), but the characters seemed more true to the book than in PC. For example, the Peter Caspian Rivalry made no sense, especially since in the book he was like "I’m not taking your spot, just helping out" whereas the Edmund Caspian rivalry has some book basis (even though VDT movie kinda regressed Edmund’s PC character). The swords and green mist were bad additions in my opinion, but also in my opinion NOTHING could be worse than that Susan Caspian ‘romance’. I respect your opinion but I really don’t see how the Caspian and Susan romance can be worse than the Green Mist/Seven Swords plot. The Susan Caspian subplot is stupid but it only amounts to a handful of pointless moments. The Green Mist and the Seven Swords drive the whole story of VDT. If it weren’t for the scene where Caspian talks about wanting to see his father, I’d have forgotten about Aslan’s country by the time the characters reached it. In the book, that’s the big climax. With Prince Caspian, I have to grit my teeth through the cliché and obligatory romance stuff, I don’t lose sight of restoring Narnia which is what the story is supposed to be about. And the Green Mist stuff isn’t even that good on its own terms! Why are the lone islanders sacrificing people to the Mist? Who benefits? Are they able to communicate with it somehow? Why does the Mist tempt Eustace to take the dragon’s treasure? His transformation actually ended up helping the crew defeat the Dark Island. Ugh! Wow, I really sound like I hate the movie. There are some things I love about it. Honestly. The big problem with the Susan-Caspian romance is this. Either Aslan is almighty (like I believe God is in the real world) and very very very cruel in allowing a Susan-Caspian romance to blossom and then sending her back to our boring world, or he is not almighty, callous and cruel for sending Susan back to our world despite her romance with Caspian. This is so against Aslans nature that it’s a horrific change. It destroys or at least goes against everything Aslan should be. Unlike the Susan-Caspian romance, the green mist/seven swords plot is a distraction of the truly fine but somewhat scattered Voyage of the Dawn Treader plot. But it sustained the essence of Aslan through is largely unchanged role in the movie plot. Of course, if the christian allegory (that Lewis denied) is unimportant to you, the essence of Aslan is less important than a good storyline. From that point I guess I could see why VODT is worse to you than PC. when I write of the truly good but somewhat scattered plot, I speak of the book plot. Not of the movie plot. Col Klink I’m kind of a sucker for certain fantasy tropes (probably because I in addition to Narnia and other uniques series, I enjoyed a lot of generic fantasy books when I was younger) so although the green mist/seven swords/save the world plot detracted from what the original book, as a stand alone plot I thought it was generically okay. Yes Susan Caspian isn’t the worst I’ve ever seen (that weird CA:CW Sharon Carter subplot is probably worse), and I do like occasionally rewatching old Disney princess movies (don’t judgeXD), whenever I watch see the weird semi flirting whatever I’m just like WHYYYYYYY??!! That’s probably why I enjoy HHB so much because you can see them grow to tolerate each other, then become friends, and at the end Lewis just mentions they got married instead of some awkward kiss scene. I generally liked the film, although it has some considerable flaws (mostly things not in the book which were invented for the story) such as the Green Mist and the appearance of the White Witch still pursuing Edmund. I liked the ship and the special effects. The addition of the little girl character may have been an attempt to attract a younger audience, but of course that is another thing not in the book. I bought the blu-ray because I thought it was a quite attractive film for my TV screen. I liked the acting too in spite of the departures from the book. Why did Lucy turn into Susan in the mirror? Georgie Henley, Will Poulter, and the rest of them are fine actors. It could have been a really good film with a more faithful story (in respect to C. S. Lewis original book) combined with actors’ talents. Sorry, Liberty, but the reason was that the Estate of C.S.Lewis did not renew the contract with Walden Media based on that movie. Then we had to wait 7 years for a legal moratorium before anyone else could make a Narnia film. I imagine this movie has already been talked to death on narniaweb,but I guess now is a good time to do it again, since the new Netflix series is coming in. I just wonder how we fans would have handled the adaptation process. I think the vast majority of people who really hated the movie threw in the towel afterwards and don’t visit NarniaWeb anymore. The remaining fans waffle from mostly disliked to liked it just ok. I suspect the comments will balance out nowadays. I’ve been thinking that I need to re-watch VODT, but after hearing that trailer audio…I don’t know if I can stand it yet. I remember thinking that the end scene with the wave & Aslan was more emotional when I was looking at the photos published beforehand than when I actually saw it in the movie. 3. The Dragon (Or at least it staying a dragon for that long) It was a very non-unique design for the creature, imo. And this is coming from someone who has seen Eragon, twice. I think the biggest problem that this movie had that the Adamson movies didn’t, is that this movie was treating kids like kids, and the best kid movies never do. If you look at the best kids movies (Like Pixar, or what have you) they know that kids can deal with intese/mature materiel (obviously within reason) This being the case, you should treat kids like they can handle it. The other two movies did this, even strongly hinting at the mass slaughter of an entire Narnian regiment, a beheding, and literally hundreds of deaths. As long as you aren’t graphic, kids can take that type of thing, and they’re okay. But VDT was like, "No, we need silly stupid stuff for them to like it." I don’t hate this movie, but it could’ve been so much better, and really is a missed opportunity. Maybe the filmmakers wanted to have more female characters in the movie, so they added the subplot with Gael the little girl. No. I liked and enjoyed that movie a lot. I think my opinion on The VDT movie changed on my way home from the theater. LOL. I entered with pretty low expectations. While I had read both good and bad reviews, the bad reviews resonated with my impressions from the marketing material. I thought the visuals looked too shiny and fake, the acting from Keynes and Henley felt awkward and the adaptation sounded…kind of nuts. So I ended up enjoying the movie OK. But on the way home I kept thinking of all the things in the movie that were dumb and annoying. By the time I got home, I wasn’t sure whether I liked the movie or not. If I were forced at gunpoint to say whether it’s good or bad, I’d say bad because it had the bits that offended me most in the whole Walden Narnia series. (The undragoning and the albatross for those wondering.) But once in a while, I watch it and I usually end up enjoying it more than I expect. So considering it was inevitably going to be bad…it’s pretty good. LOL. I disagree with Glumpuddle though that Lucy expecting not to come back to Narnia made the revelation less emotional than it needed to be. Just because you expect something bad to happen doesn’t mean you don’t mind when it does. (For example, I sometimes expect to do badly on a test but that doesn’t make it a better experience.) I thought Georgie Henley did a good job with her voice making it seem like she was really broken up by having to leave this place, one in which she’d technically lived longer than at home. (This was one of the only scenes where I thought Henley did a good job actually. Mostly she just looks bored in this movie.) Since she knew that Peter and Susan had had their last time in Narnia, it doesn’t seem too unlikely for Edmund and Lucy to suspect they would have a last time soon. It’s different from the book but I don’t think it robs the exchange of emotion. My favorite TV shows are probably "Monk" and "Gomer Pyle USMC." This movie gives me so much nostalgia. I was excited for this movie because I loved the other two. When I first saw the movie, I hadn’t read the book, so I called it the best of the movies. But when I did read the book, my opinion dropped, but only slightly. Now I think it’s the weakest of the movies, but I still really enjoy watching it. I remember having a dream of a VDT movie billboard in a road near my house because I was anticipating it so much! When it came out in cinemas, I went to see it during the first week. I remember enjoying it. I really liked the Pauline Baynes illustrations during the credits but I forget what I thought about details of the scenes in the movie. I remember feeling disappointed that the song over the credits was different here in Australia than in other countries. You had Carrie Underwood but we had an Australian Idol singer called Stan Walker singing a different song. I normally like him as a singer, but his song was terrible. Back to 2005, I had a friend who I learned was a big fan of the Narnia books. We saw the LWW movie separately and at New Years Eve that year, he said he disliked it strongly. He wished there were more lines taken straight out of the book, e.g. "Oh, it would be raining!" (hope I remembered that accurately!) Well in the end we never saw a Narnia movie together. This was noticed after VDT had been in cinemas. My friend disliked all 3 movies and after that we would talk about the negative aspects of the films. I realised recently I need to be more clear and confident about what my opinions actually are. Because I really enjoy all 3 of Walden’s Narnia movies, while at the same time recognising some weaknesses. To be honest, I don’t like the design of the Dawn Treader. To me, the brassy colours of the wood look tacky and the dragon figurehead is not Narnian enough. I know this might be an unpopular opinion because I know a lot of Narniawebbers like the look of the Dawn Treader. All in all, I enjoy the movie and I watch it at least once a year. I can see some of the flaws. I think people notice more of the flaws when they think about it and analyse it too much, so I try to avoid that! Is there anyone else who like me, isn’t a fan of the look of the Dawn Treader? I felt it looked a little too shiny too. It would have been good for them to make it looked more weathered as the story went on. A little chipped paint would have been nice. Can you link to Stan Walker’s song? It’d be interested to compare it to the one in the "mainstream" cut. It was hurtful. It was if the writers weren’t all that bothered with it. I mean, seriously, the green mist? 8 years later and I still haven’t dealt with it. The Ed/Caspian rivalry, the Gael character, bringing back Ed’s jealously, Caspian has an accent and then he doesn’t … need I go on? They left out the most important part of the whole story – "Courage, dear heart". I think Skandar & Georgie did the best with what they were given, though Will was perfect as Eustace. I just wish they had put as much thought into as LWW & PC – it had the potential to been a magnificent film. In saying that though, I still watch it because there’s only 3 Narnian films and I always cry in the good-bye scene. If you believe Dr Ward’s "Planet Narnia", you’ll know the guiding planet in "Dawn Treader" is SOLA, The Sun. The theme of "Dawn Treader" is Illumination, Revelation, Enlightenment. Caspian is an "Apollonian" leader. Narnia is at a moment of peace and plenty; and Wisdom is Caspian’s new dream. On each adventure/island the section concludes with something previously hidden being REVEALED by bright "light". Aslan appears seven times; each time, he is more SOLAR. The ship is sailing in the direction of the rising SUN. The last sea is made of not water but liquid LIGHT. By the end, the Illumination gets so "Meta", Aslan basically explains the author’s Christian intentions. This is the Narnia book I wish had been adapted by Stanley Kubrick, not fumbled by the Walden team. I dislike Dr. Ward’s writing. He tends to sound like a pompous blowhard (though I have a theory that may be how his publicist encourages him to talk like that rather than it being a reflection of his own personality.) But I agree they really failed at capturing the imagery of the book without the sun getting bigger or the drinkable light. Yes, the answer is "yes!" It was a bad movie. As I left the theater, I was stunned and speechless at how awful it was. I never watched it again. I personally think the main problem was that the director didn’t connect to the story and to the young actors the way Andrew Adamson did. The most heart-breaking part for me was the lost opportunity to take an amazing story and make a film that was both wonderful and different from anything we had seen before. Excellent point about Andrew connecting to the siblings. That might the central point about the differences between the movies. Michael Apted was much more combative. He and Mark Johnson, the producer, got into big fights on set. Andrew Adamson and Mark Johnson had a very professional and friendly relationship. The book VDT is one of my favorites. The movie VDT was OK as a movie but terrible as an adaptation of the book. The green mist and seven swords thing was really bad. I remember the first time I saw the movie I thought, "What is this doing here". The movie completely changed the sea monster theme for the much worse. In the book Eustace was heroic against the monster and Reep showed restraint and imagination. What I most disliked about the movie was the changing the nature of some of the characters. In the movie Lucy was a different person. The Edmund-Caspian relationship was different. Adding the Susan scene and the Gael character were fine. The Lone Islands scene suffered badly. Even the extras added to the Blu-Ray disk were not very good. The Disney extras were good to very good. The book is very character driven. The movie was about battles. This movie showed that Lewis was the master not Hollywood. All the movies were directed by people who were Lord of the Rings fans more than they were Narnia fans. The two worlds are very different. I am a Narnia fan hands-down. (This could be a good survey for people to rate at which end of the LOTR-Narnia spectrum they are.) As in life we see what we choose to see. I hope that Netflix puts together a team of real Narnia fans. I saw the VDT movie 24 times in the theater because I knew the series was in trouble, and I did what little I could to keep the series going. I just knew that Narnia was dead after this stinker. I still have the movie receipts. It is so easy to become a Eustace, who sarcastically says as he drudges along on Dragon Island something like: “Oh, sure. Follow the imaginary Blue Star to the Island of Raman-doo-doo and place on the table of the talking lion the four steak knives of the seven lords.” Eustace doesn’t like the plot any more than many heart-broken fans out there. I understand. As we have taken this ride over the past year and a half since filming began (the rumors date back even longer), we have often wondered and fumed over what those filmmakers have been doing to “our book.” Well, guess what? They haven’t taken it away from us; we can always pick it up and read it whenever we want. So, I have decided to enjoy both the movie and the book for what they are. Both have merit, I believe. The book will always be my first love, but I have decided I can love the movie, too. A Narniawebber called sweeetlilgurlie wrote a great comment that relates to what you wrote. I hope she doesn’t mind my reposting it here. You love your mom a lot. You know her really well. She’s a great woman. Someone makes a movie about your mom. In short, they represent her as a jerk and a very mean/bad woman. Wouldn’t you be mad? Would you just say, "But that doesn’t change my mom!"? The last bit is true, but it changes the way people view your mom! To a lesser extreme, that’s a bit of what happens in unfaithful adaptions. It gives an untrue picture of the original story, and, quite frankly, that bothers me because of the misrepresentation. (Col. Klink speaking again.) I agree that the prop for the Magician’s book was awesome! It looked just like Lewis’ description. I hesitate to say the whole scene was brilliant because I didn’t like that they cut Marjorie Preston and Anne Featherstone and the whole Lucy wanting to be like Susan bit was pretty meh compared to the book. Incidentally, did anyone find it odd that the visibility spell listed "the truth in theology" as something invisible? Since many Christians are fans of the Narnia books and they can see truth in theology, I thought it was odd that they would write something that would potentially offend them. Not that I think they should pander to Christians but considering that the movies were losing popularity, you’d think they wouldn’t want to alienate what audience they had. The quote that "Truth in theology" was invisible was a confusing statement. I guess it was because the director was an agnostic. It would’ve been better to leave it out. It probably wasn’t the best idea for the BBC Narnia to shorten Prince Caspian to only about one hour and Voyage of the Dawn Treader to two hours. Both books deserve longer time, but I guess that this was a budget limitation which was beyond the control of those who created the series. Dawn Treader was about as long as the movie version, although I think it was a much better story adaptation. I liked the soundtrack music in both versions, but unfortunately the BBC’s complete Narnia music is not available on audio CD. The movie music is worth getting. I think it’s one of the better film soundtracks of that time. It works well with the film, and it is very listenable on its own. I loved the Voyage of the Dawn Treader movie, but I can see why it did not make as much money as the first two. One thing that feels awkward when watching the movie is the green mist and the way they spoke about the theme of temptation. I like how they emphasized avoiding temptation, as temptation is very dangerous and not often addressed correctly in popular culture, but it felt like they were talking down to viewers. The tone is different from the first two, but it fits the way they did the story. I think basically I was happy they made a Narnia movie! I even went back and saw it a second time in the theater — I usually don’t do this, the only other movie I’ve watched a second time in theaters is Avengers: Infinity War. King Caspian was a lot more like his book character than he was in the PC movie. Lucy was able to be queenly and still wonder at seeing the new islands and what they had. Lilliandil and Drinian were portrayed perfectly. Basically, I felt the characters were well-portrayed and acting in character even if the story was changed some. The writers were right, however, that the story in the book is more episodic and might fit a tv show better than a movie. Maybe if Netflix actually makes the Narnia tv show, they will have one island per episode or something like that. My initial responses on Facebook were pretty positive. It was once I had discussed it a bit here that I realised what I was not happy with. Someone who saw it before me said I would probably like 90% of it. Close. I thought Dawn Treader was just OK. It wasn’t the worst movie I’ve seen, by a long shot, and also wasn’t close to be one of the best. It’s the weakest of the three Walden adaptations, by far. Does that make it "bad" though? I’d say no. Being the weakest adaptation doesn’t make it a bad movie. There’s still plenty of enjoyment in it and the cast is well done. Now that we’ve been without a Narnia movie for some time and I’ve seen adaptations like A Wrinkle in Time, Oz, Alice in Wonderland come out, no, I’d even argue that Dawn Treader is in the better half of the fantasy movie spectrum. I actually agree. Dawn Treader was okay. It had its moments to shine. As a whole I feel it was a pretty rotten adaption, but a okay movie. Yes it has problems, but I liked many parts of it enough to have enjoyed the movie. Cinematography was good. The introduction scenes were good, the end was good and the End Credits were good. In fact Caspian was better in this movie. I’ve commented a lot on this podcast but since I wasn’t on Narniaweb when the movie first came out, I’ve never really expressed my whole opinion of it here so now I’m going to do that. I’m going to divide my commentary into the good, the bad and the mixed. If you don’t like reading criticism of the movie, Liberty Hoffman, you can just read the good stuff. Ben Barnes and Will Poulter were great. Caspian didn’t show as much range as he did in the book (and he arguably didn’t have that much range even there) but Ben Barnes really does a good job with that bland nice guy role. And Will Poulter did great with both the good Eustace and the bad Eustace. Even though I think the radio theatre drama is the best adaptation of VODT, I feel like Eustace’s voice actor sounds too over the top in his bad phase. He sounds like he knows he’s supposed to be annoying. Will Poulter’s Eustace came across more like a real annoying kid who honestly believes that he’s in the right. Your mileage may vary on this, but I found this movie to be the least visually appealing of the three and frankly it’s not even a contest. The art direction was too pastel and everything looked a little too shiny and fake. Maybe, like Glumpuddle said, it had to do with the cameras they used. This story seemed like one that the scriptwriters didn’t really want to tell but they had a contractual obligation. I hesitate to say they should have gotten different writers because some bits of dialogue are really good. (Eustace’s comedic carping was probably the funniest part of any Narnia movie for me.) But there were also a lot of silly sounding lines, mainly from Coriakin and the whole Green Mist/Seven Swords plot needed some ironing. Like why would the Telmarines have magical swords from Narnia’s golden age? I thought they hated the Old Narnians. And if the swords were supposed to protect Narnia, how come they didn’t do anything against the Telmarines? In general, everyone who worked on this project seemed like they put less effort into it than the previous movies. It would be too easy to blame this on the director…but I do. 🙂 A good example of this is the scene where Edmund and Caspian go crazy over the goldwater. The same thing is supposed to be happening to them but the two actors play it totally differently. This leads me to think that the director didn’t have a specific vision for the scene and just told them to do whatever. It feels like Michael Apted, unlike Andrew Adamson, just wanted a paycheck and didn’t put a great deal of thought into the movie and that attitude bled into the whole production. This movie also had the two moments which insulted me as a fan more than anything else in the Narnia movies. The way the dragon randomly scratched himself before the undragoning and Lucy staring at the random albatross. I felt so insulted that the filmmakers thought they totally change both the dark island and the undragoning and appease us with those careless bits of nonsense. I’d rather they totally dropped those homages to the book. At least then the movie would have made more sense and I wouldn’t have felt actively insulted. I have really mixed feelings about the ending. The music was great. The acting from Keynes and Henley was better. (Maybe not as good as in the first movies but better than the rest of this movie.) The visuals were nice and it really felt like the book even though the details were changed. But even this scene had a few really dumb lines. Like Reepicheep calling Eustace a "magnificent puzzle." I think they were a little desperate to make Eustace a big hero after he’d been a whiner for so much of the movie. And what was with Caspian saying his father died fighting for something? It was implied in PC that his father was murdered in his sleep! It’s one thing for the screenwriters not to be able to remember the books’ continuity but now they can’t even keep track of their own. And, perhaps tellingly, this ending didn’t seem to match the rest of the movie. We’d only had the a couple of scenes with Caspian and Reepicheep wanting to reach Aslan’s Country. So my reaction to their doing so wasn’t much more emotional than "oh, that’s cute." It felt like this ending was originally attached to a better movie/adaptation and got edited onto the end of this one by accident. As the film ends, I kind of feel like screaming, "Wait! Come back! You were just getting really good!" LOL. I never thought of where they got their swords, however I’m guessing the screenwriters also didn’t think of where they got the swords. Considering they were magically connected to Rhindon, MAYBE Father Christmas? Gael’s name reminds me of Peeta’s from the Hunger Games. Changing the spelling doesn’t make it particularly clever. As for the "My father wouldn’t be proud of me giving up what he died for" line, I think he meant Miraz’s greed and jealousy to rule drove him to killing Caspian IX, hence Caspian’s father died for the Narnian throne. VDT was a disaster. I thought that when it came out and again when I watched it recently. Too bad they did that to possibly the best book in the series. I watched the movie as a child, and I loved. When I re-watched it after reading the book, I found it OK. I can see why anyone would either love or hate this movie, and I can relate to both sides. I’m not that big a fan of the book either, but hopefully Netflix will make a better adaptation. Heya now i am for the first time right here. I came across this specific aboard and i also to locate It truly beneficial & them taught me to be out and about considerably. I am hoping presenting one thing back again and also support other people as if you assisted me German courses.